This recipe hails from a friend in Andros, Greece named Evangelos who has a reputation as a great food connoisseur. In order to achieve maximum flavor, you will need to let the chicken marinate in the yogurt mixture overnight. For larger quantities of chicken, simply double the recipe. Using a whisk, combine the yogurt, mustard, olive oil, garlic, salt and pepper in a bowl. Place the chicken in a non-reactive container and pour the marinade over the chicken. Cover and let sit overnight in the refrigerator. Preheat the oven to 375 degrees. 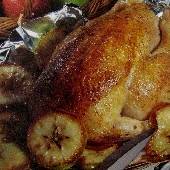 Line a baking pan with aluminum foil and lightly grease. Combine the cornmeal and sesame in a plastic bag. Drop the yogurt covered chicken pieces in the bag and shake to coat. Place the chicken pieces on the aluminum foil and drizzle lightly with olive oil. 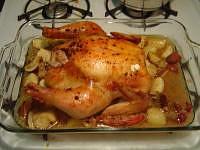 Bake in a preheated 375 degree oven 15 – 20 minutes or until nicely browned.